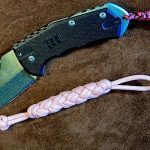 I did however follow his instructions and produced this purple Paracord lanyard. 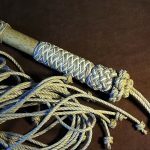 In the past I have made them from 3 strand cotton, but this time I wanted to see how Paracord would suit. 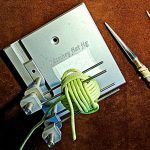 First of all you need to fold both lengths of cord in half and then seizing them together to form two loops about 2 1/2″ and giving you four ends to work with, two long and two shorter lengths. 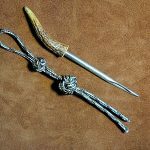 The next thing is to tie a Diamond Knot, by firstly loosely tying a crown knot followed by a wall knot, then double by following round the original cord. The Diamond Knot is then worked tight. It is now at this point you can decide whether or not you want one or two loops at the end of your lanyard. So if only one loop is required when tightening the Diamond Knot you can pull one of the loop up tight into this knot. I then decided to tie a Matthew Walker knot and then continue a bit more with the 4 strand round sennit. 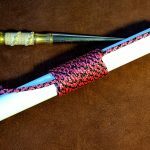 Then for about 24″ a flat Portuguese sennit was tied so that the cord sits nice and flat against your neck. This is then followed by another Spiral Portuguese sennit, but this time make sure that the spiral goes in the opposite direction to the first one. Your remaining four strands should now be spliced into the four strand round sennit. Then tie another Diamond Knot (doubled) that forms around the four strand round sennit. Then finally cut off the loose strands and tuck the ends into the Diamond Knot.